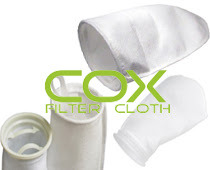 OIL ABSORBENT FILTER BAG, China OIL ABSORBENT FILTER BAG, Quality OIL ABSORBENT FILTER BAG manufacture by COX Filter Cloth. Size:7*17”,7*32”,4*9”,4*15”,other size can be custom made according requirement. 3. Applications of oil absorbent filter bag : Be used in industrial areas as electronics field, foodstuff industry, etc.